The Old Treasury Building built in three stages between 1883 and 1928 – today it is home to the Treasury Casino, however it has also housed many government agencies including Queensland’s Premier, Colonial Secretary’s Office (the Colonial Secretary was the public servant at the head of the Premier’s Office), Registrar-General, Treasury, Mines, Works, Police and Auditor-General. This was not the first building to be built on this site – in 1825 the site was reserved for government purposes, and became home to convict built officers and military barracks. In 1831 Brisbane’s second Military Barracks, built of stone and brick, stood on this corner. Brisbane Town was established in May 1825 as the Moreton Bay Convict Settlement under the command of Lieutenant Henry Miller of the 40th Foot Regiment. Initially the military were housed in tents, but by late 1825, early 1826, temporary slab barracks had been built at North Quay on the northern side of present day Queen Street. Two huts were provided for the sergeant, corporal and twelve soldiers while individual huts were provided for the married soldiers. Lawrence Vance Dalhunty, who arrived in August 1825 to take over the positions of both Superintendent of Convicts and Acting Engineer, described part of the early military barrack in his Quarterly Return of Public Labour & Expenditure of Materials 25 December 1825-24 March 1826: the erection of ‘two wings to the military barrack, 15 feet by 25 feet, and 30 rod of 10-feet 2-rail fence enclosing the military barracks’. However, as more convicts were sent to Moreton Bay the number of soldiers to guard them also grew substantially and before the end of 1826 both the convict barracks and the military barracks were becoming severely overcrowded. On his arrival in March 1826 the new Commandant, Captain Patrick Logan of the 57th Regiment, was not so worried about the quality of the existing slab buildings, the prisoners’ barracks concerned him more; they were inadequate, the prisoners needed to be securely rehoused in a much larger building so a new military barrack was not a priority. Logan considered that other more substantial buildings for the settlement were urgently needed – a secure gaol, a hospital, a lumber yard, and a store. By the middle of 1827 the hospital buildings had been finished, the prisoners’ barracks were nearing completion and work had started on new brick buildings within the compound at North Quay to enlarge the military barracks. It was recorded on 18th February 1829 that there were now 772 convicts stationed at Moreton Bay and around 100 soldiers were needed to guard them. To add to the overcrowding some of these soldiers had their wives and families with them. Logan was even suggesting that part of the hospital may need to be appropriated as a military barrack. In view of the overcrowding of the military at North Quay, in July 1830 it was decided to build completely new military barracks on the site now occupied by the Treasury Building, between present day Queen Street and Elizabeth Street. Logan was directed by Sydney to construct a military barrack for 100 rank and file, and the Director of Public Works was asked to produce a plan for it. In September 1830 Governor Darling in Sydney approved the plan and in July 1831 the Deputy Commissary-General was asked to provide iron for the new military barracks at Moreton Bay. This was sent from Sydney on 1st August 1831. The two-storey Military Barracks built on this site was flanked by a single storey Guard House on the left and Officers’ Quarters on the right. In 1864, the barracks became the offices of the Registrar-General, Treasury and Engineer of Harbours, although a single storey building was also built in 1874 for the Registrar-General on the corner of George and Queen Streets in anticipation for the government’s redevelopment of ‘Treasury Square’. This project took off in 1883 when a competition was organised to design a 2-storey perimeter block to occupy the square. The competition was won by Melbourne architects Grainger and D’ebro but their design was never used. Queensland’s colonial architect John James (JJ) Clark argued that it should be a 4 storey building erected as needed and his design was subsequently used. 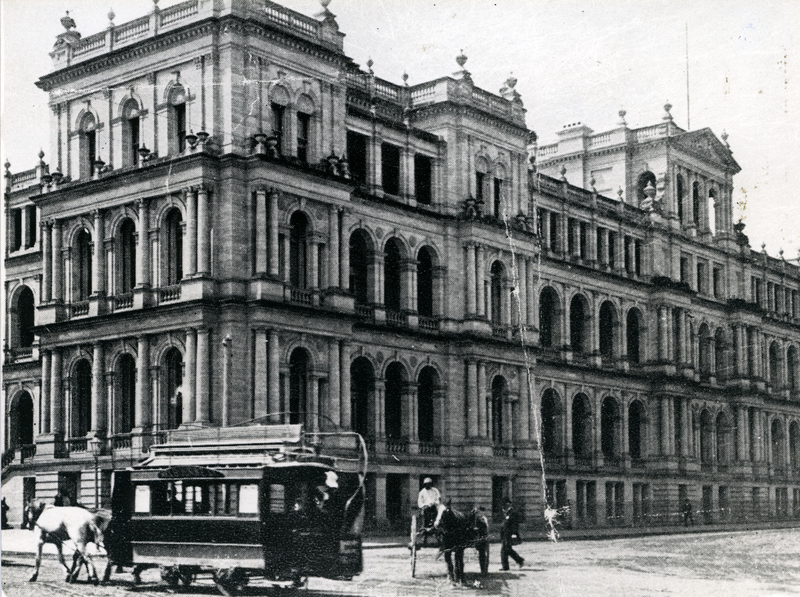 The Treasury Building was subsequently completed in three stages between 1883 and 1928. The first stage of the building, which fronts William Street and the river, was completed in September 1889 by Sydney-based builders Phippard Brothers and Co. at a cost of £94,697/10/- . The corner of the building facing William and Elizabeth Street’s were occupied by the Premier, Colonial Secretary, Registrar-General, Treasury, Works, Police and Auditor-General. It was also home to Cabinet and Executive Council from 1889-1905. The sandstone used in the building was brought in from Highfields. The second stage (or Elizabeth Street and two-thirds of the George Street section) was completed 1893 by John Jude of Adelaide and architect JJ Clarke at a cost £67,000. In the 1890-1900’s the building was a symbol of self-governance and a focus for celebrity and patriotic displays – the 1901 proclamation of Australian Commonwealth read from the William Street elevation. The sandstone for both this and the third stage of the building was brought in from Helidon. The third stage, completed in 1928 at a cost of £137,817, differed slightly from JJ Clarke’s design, having a more distinct 1920s style of architecture. In 1971 the Treasury and Works department moved to the new Executive Building in George Street, severing treasury ties to the building, and by 1989 the Registrar-General remained the sole occupant of the building. After a major refurbishment, the Treasury Casino opened in 1995.